The TLJMS Scholarship Program has been recognizing, rewarding, and assisting future scholars in our community for many years. Students recognized are typically those who excel academically, are dedicated to community service, and/or have an interest in pursuing careers in STEM fields. We actively seek middle, high school or current college students who exhibit leadership, community involvement, exemplary character and high academic standards. Two of the scholarships we award every year are named in memory of Dr. Katia T. Laremont, and Dr. Mildred Anderson, two physicians who were active in TLJMS for many years. These scholarships are given to a student with an interest in healthcare and/or science. To learn about our scholarship program, contact us here. Five students from Glades Central Community High School were rewarded for their academic achievement on Friday, April 21, 2017. Pictured are Ja-Bray Loud, Doris Cabrera, Dr. Colette Brown-Graham (T. Leroy Jefferson Medical Society past president and scholarship committee chair), Nikia Anacrayon, Chandler Chisholm, and Jean Noel. 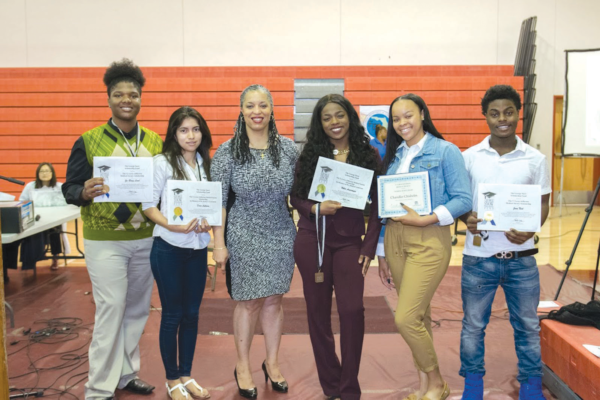 BELLE GLADE — Five students from Glades Central Community High School were rewarded for their academic achievement on Friday, April 21, 2017. The students plan to pursue a career in healthcare, and together they are the recipients of $4,500 worth of scholarships, as follows. • Jean Noel, Veterinary Medicine, $1,000 scholarship. T. Leroy Jefferson Medical Society, named after the first African-American doctor in West Palm Beach, awarded the scholarships. T. Leroy Jefferson Medical Society (TLJMS) has been awarding scholarships at Glades Central High School since 2012. This year, the medical society partnered with George Snow Scholarship Fund to administer the scholarships and for the selection committee. Scholarship recipients were selected based academic achievements and on the strength of their scholarship applications. After the scholarship ceremony, members of TLJMS participated in the career fair. A doctor, nurse practitioner, physician assistant, and medical student were available to answer questions from students considering studying a health-related field. The society gave curious and impressive students free anatomy books and stethoscopes to encourage their interests.